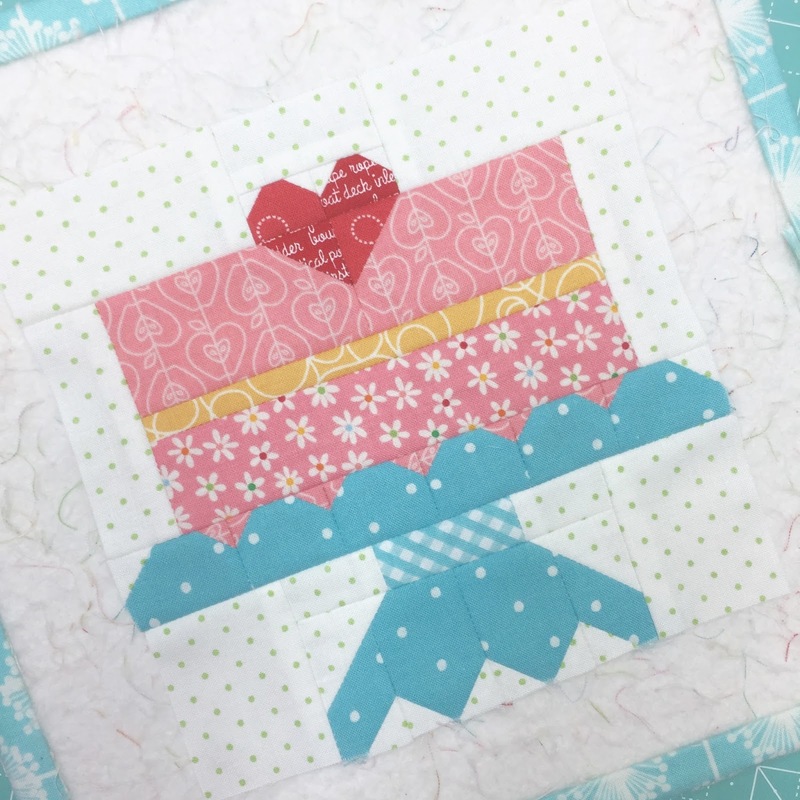 Bee In My Bonnet: A New Farm Girl Friday - Happy Anniversary Farm Girl Vintage and a free Farm Girl Layer Cake Block Tutorial - Farm Girl Layer Cake!! 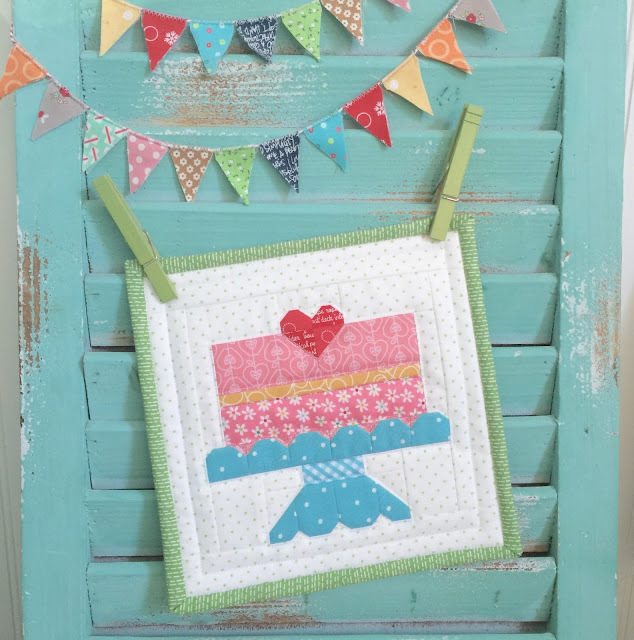 It's Sew Emma by making a cake! Every celebration needs a cake right? and then I'll show you how to make it! cut all of your ingredients. how I made my 6" block. 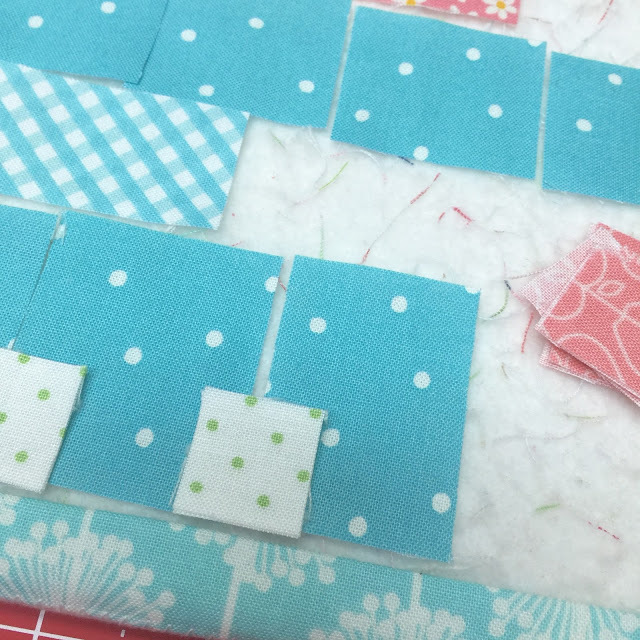 *NOTE* - I also cut a green 2 1/2" x Width of Fabric for binding. but you will need 2 if you are making the 12" block. Now lets bake a cake! Lets start with the top layer of the cake. 1. All of the smallest background squares are (G). Place one on each side of the heart tops (P) with right sides together. and stitch from corner to corner like this. 2. 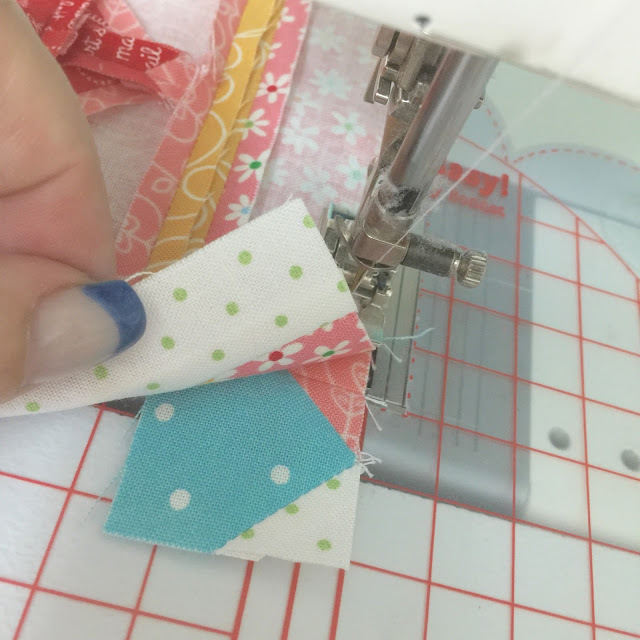 Trim an approximate 1/4" seam allowance and press your seams OPEN. 3. Place back down on your design board for the next step. 4. Yes...I said press your seams open! that your blocks will lie flat be more accurate. and I will let you know when we get there! 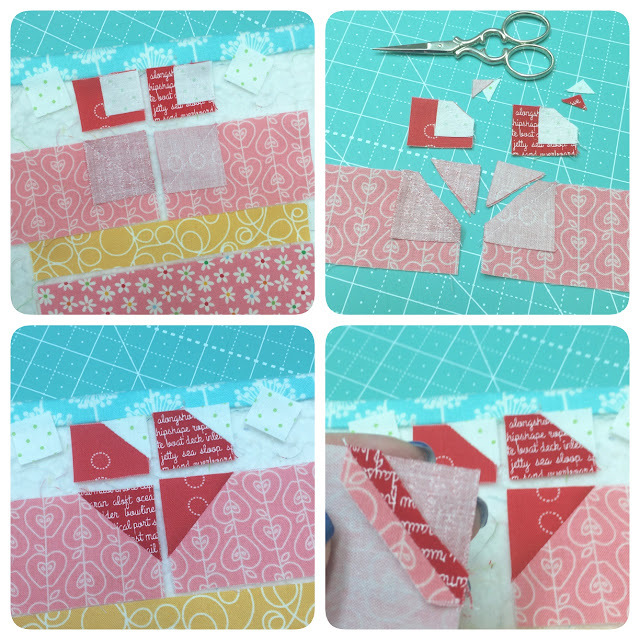 and sew the other easy corner triangle. 2. Place them back onto design board. the two heart bottoms together like this. frosting (K) to the top of the bottom cake layer (I). and pressed frosting/cake seam open. to the top layer and press open. each side of the cake and press towards (D). the center seams in your heart line up. and now its time to place it on your cake stand! Here's another thing that I do to get my blocks to lie as flat as possible. 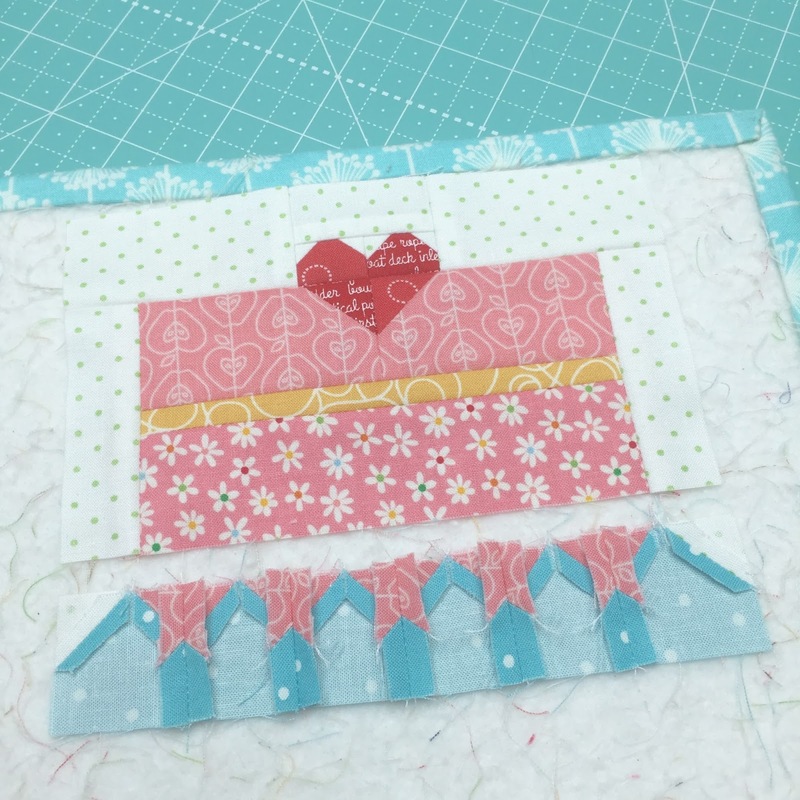 I quickly put a ruler on top on hold it down firmly until the block cools off. 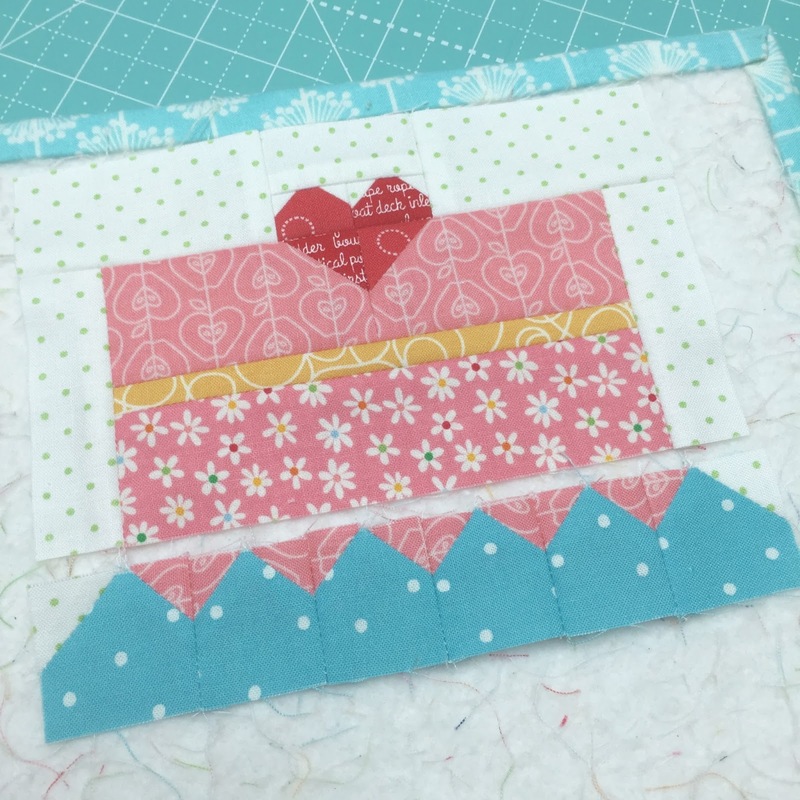 I do this especially when sewing small blocks or little pieces in a large block. my blocks are flat and accurate. 1. Sew the easy corner triangles onto the (N) pieces of the cake top. Use one (G) for the left side of the end piece and the other little squares are (J). 2. Repeat for the right side of the cake stand top pieces. 4. Press seams open and lay back out on your design board. 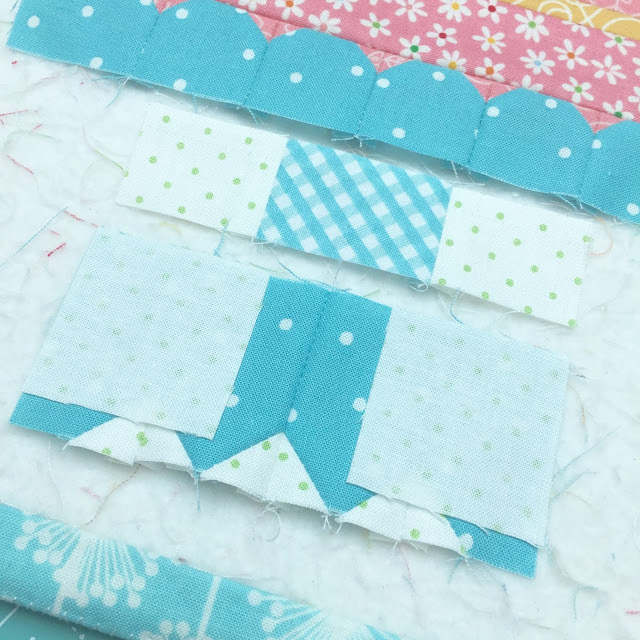 for the top piece that you are sewing it to. You can see that mine is just a smidge longer. design board and ruler trick! the bottom rectangles (M) (L) of the cake stand like this. 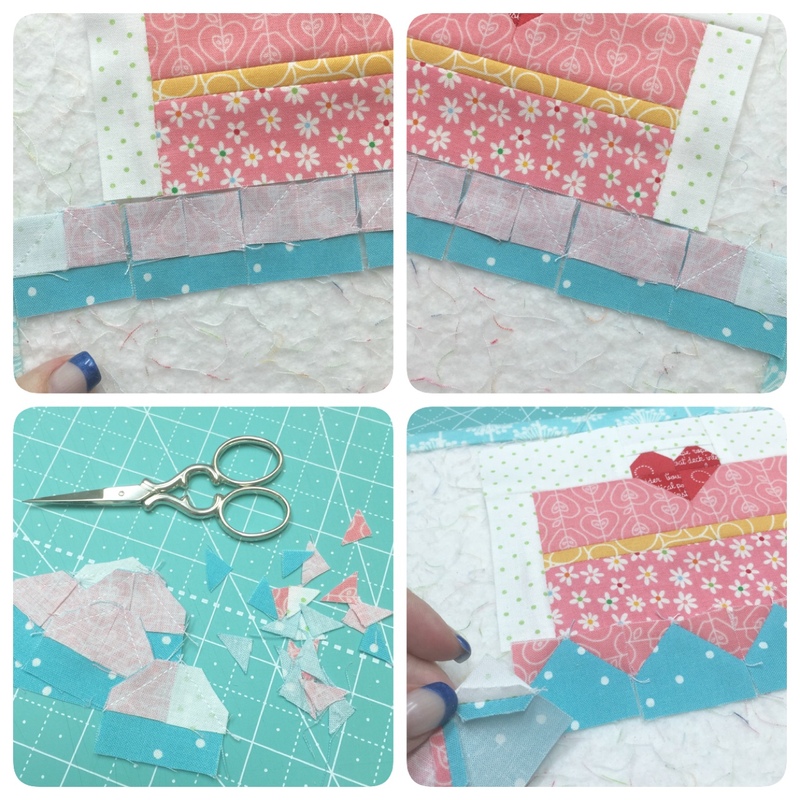 sew them together and press the seams open. 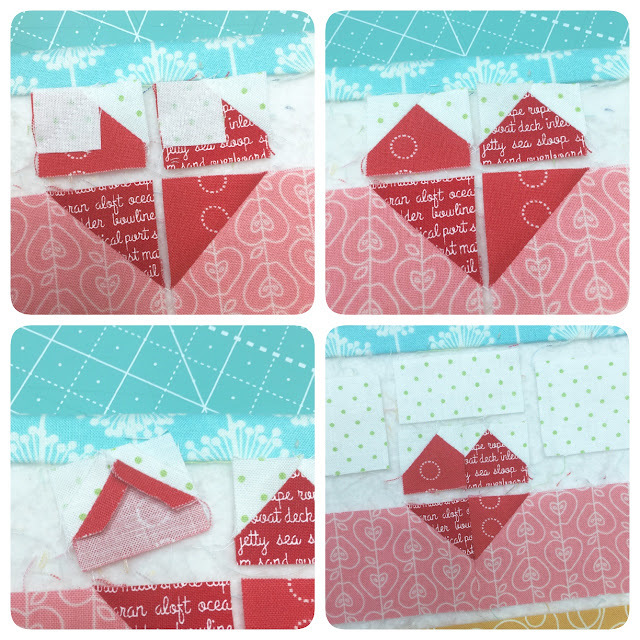 sew the easy corner triangles (C) onto the top outside corners. 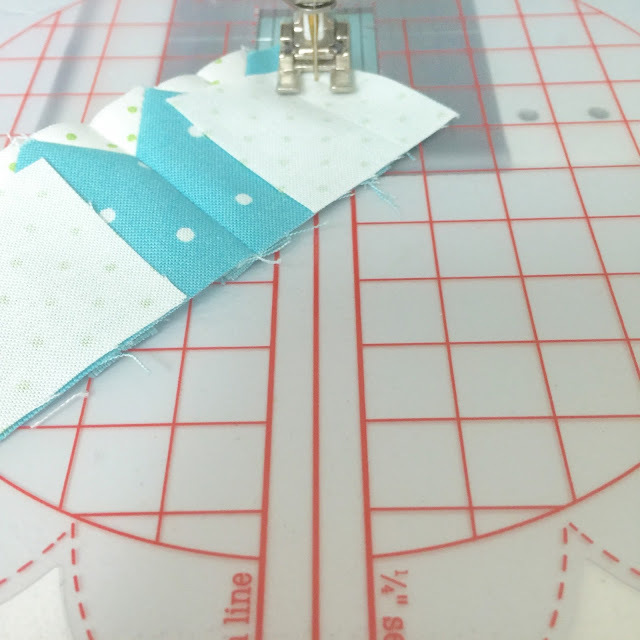 and for an accurate 1/4" seam of course! With seams pressed open of course! add the side pieces (A). 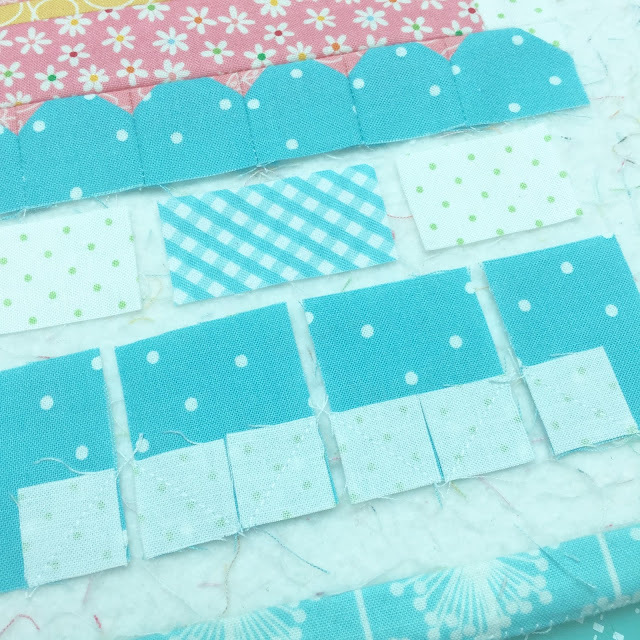 by layering the blocks with batting and backing fabric. 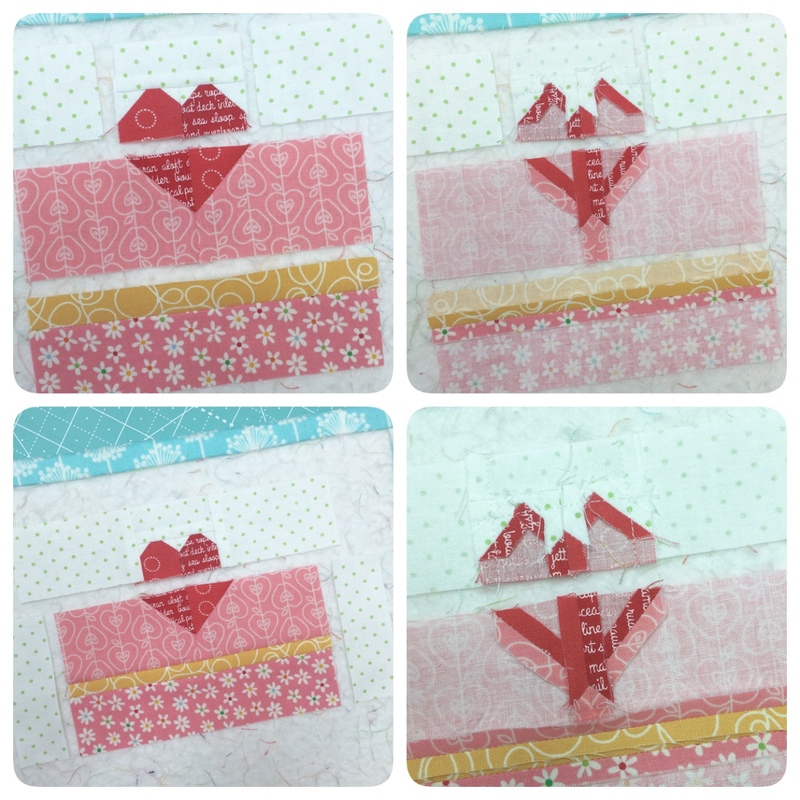 I prepared a binding for each as well. completely baked and ready for a celebration! Thanks so much for joining me for another Farm Girl Friday! that others have been baking! 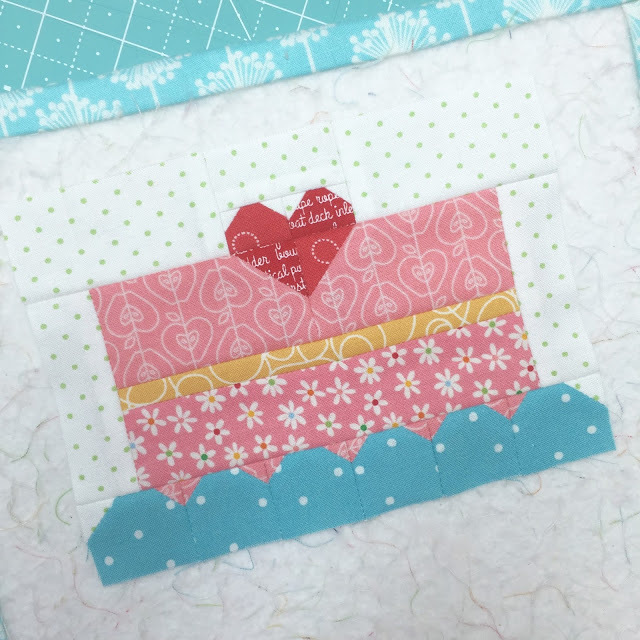 I just love your new cake pattern. I've also found your new Farm Girl Pattern - delicious surprises. Your blocks always bring a big smile to my face. Love sewing them! Thank You, Lori, for all the fun! This is cute as can be. Going to make it for our celebrating of birthdays here. This is so cute! What a wonderful idea to help celebrate family member's birthdays. I think I will make the smaller one to hang on a stand somewhere prominent in the home and the larger one make into a pillow for the birthday "person" to use the week of their birthday. Just so sweet! Thank you for sharing! Happy Anniversary. I have so loved the Farm Girl Vintage and all the extra blocks that have come with it, and yes I have gotten most of them. Thanks so much for this cake block and for all you do. Have a wonderful vintage kind of day !! This is my most favorite book by you and I bought all the extra's you put out-especially little piggly wiggly as I call her. 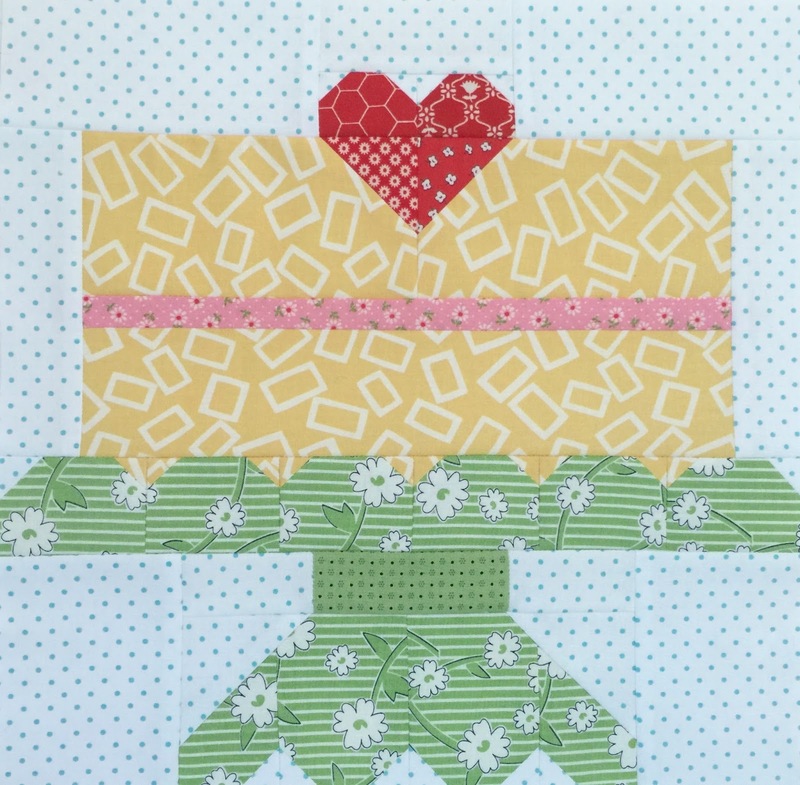 Please tell us you'll add more, especially that cute tractor hauling the cake-so adorable! 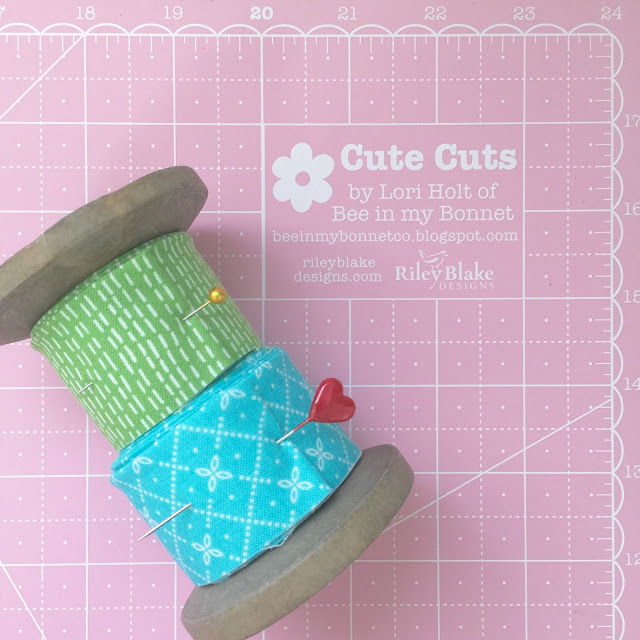 Lori, thanks for another adorable pattern! I am so glad you have such cute designs. 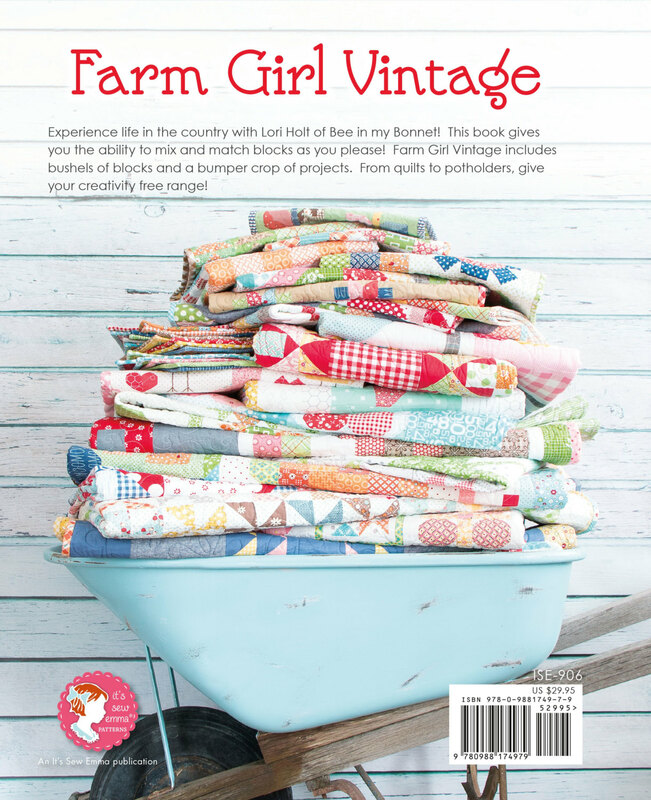 Happy Anniversary to Farm Girl Vintage book. I love my FGV quilt and it is hanging on the wall in my sewing studio. 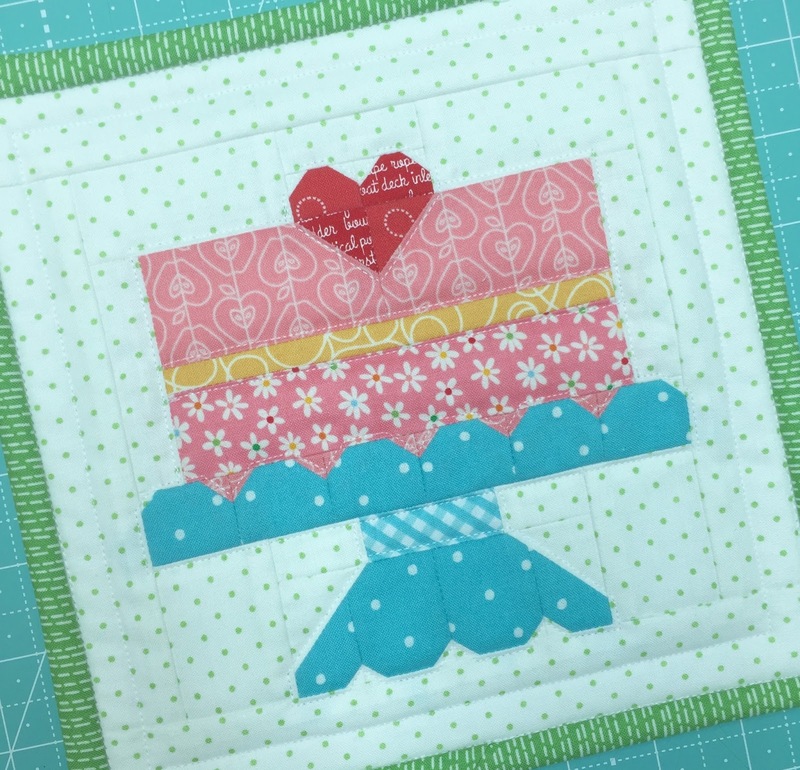 It blends well with the Quilty Fun quilt on the other wall! 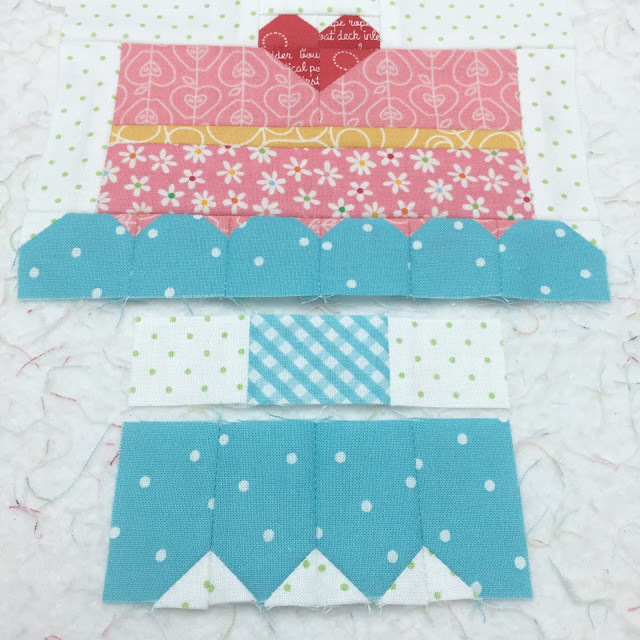 These blocks are all so adorable Lori! Thank you so much for bringing us so many fun ideas and inspiring projects this last year! You are brilliant! 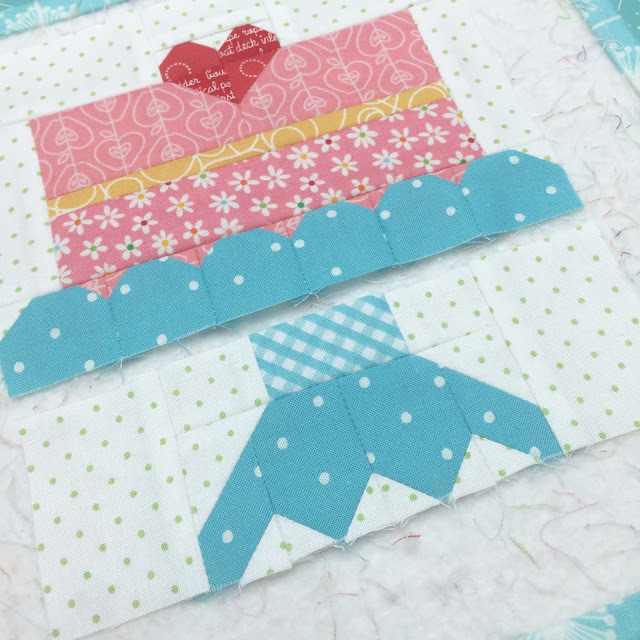 The quilting fun continues! Dear Lori, I adore you. Thank you so much for sharing this layer cake. What fun. I should make a bunch of these. I love your fabric too. Now, here's the thing. I need to go to sewing jail. I am sew busy taking care of my mom and dad. They are 93 and very very cute and silly. They need help though. So, when I get home, well, then maybe my daughter needs help with baby Sarah, she is one. What do I need? Yes, I have a featherweight, but that does not work so well for giving full attention to my old and young peeps. So I dream on, and sew just a little every day. It is people like you that are the angels that keep my happy and enthusiastic because of your sharing. Everything you do is. So. Stinking. CUTE! 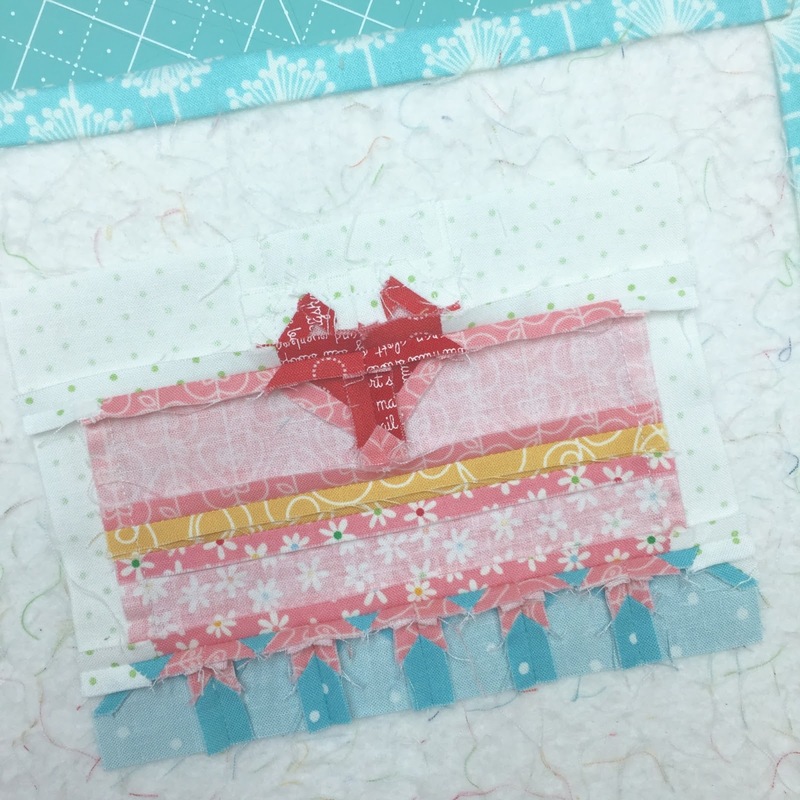 I just made a couple of honey bee blocks yesterday, and I've already got the notice set up for Fat Quarter Shop to tell me when your new cutting mats and Sew Cherry 2 are in stock. When my last child is out of the house and we downsize, I would love to have a cozy little cottage like yours. Might take a bit of convincing for hubby to agree, but I've got time to devise my plan. :-) Thank you for being you and sharing your beauty with the world. 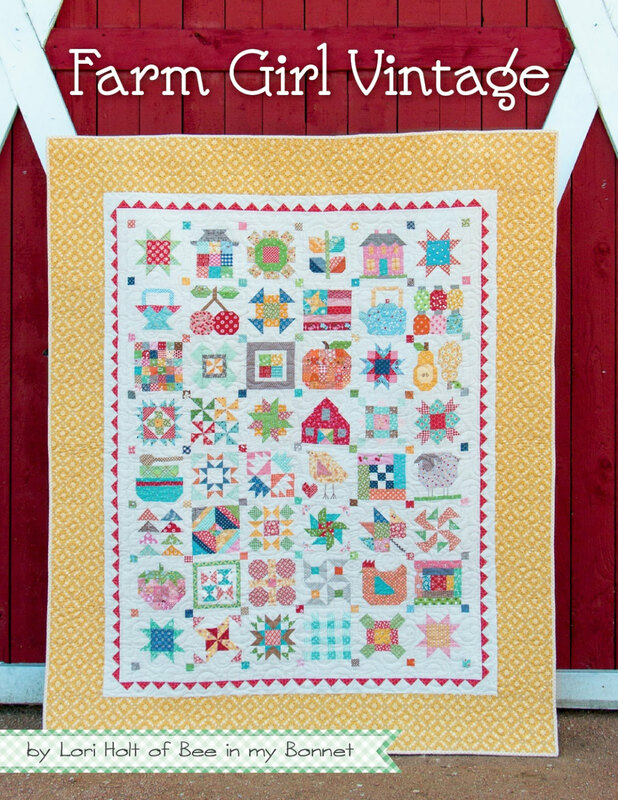 Thank you for the darling block and Happy Farm Girl Anniversary! I am working on my FGV doing a BOM at my LQS Daydreams Quilt n Sew and enjoying all of it! Love, love, love it! Hi Lori. Congrats on your one year anniversary of Farm Girl. I've followed your blog and been amazed by your talents for years. So happy for all of your success! You are one talented gal - thanks for all of your inspiration! 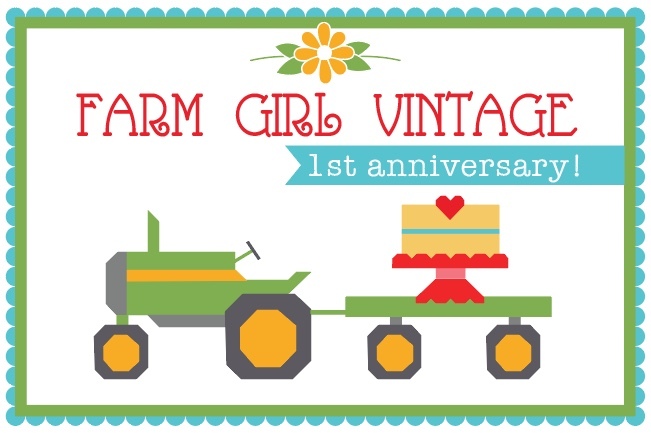 Congrats on your anniversary for Farm Girl Vintage. I have never had as much fun sewing quilt blocks as with this book. Thank you for the cake pattern! I am looking forward to see what comes next from you! Have a great weekend! Thank you for sharing this wonderful cake pattern and tutorial with all of us. You do the sweetest things so freely for everyone. What a blessing. Congratulations on your one year anniversary! Get out and celebrate!! Congratulations! I love your blocks and your books. 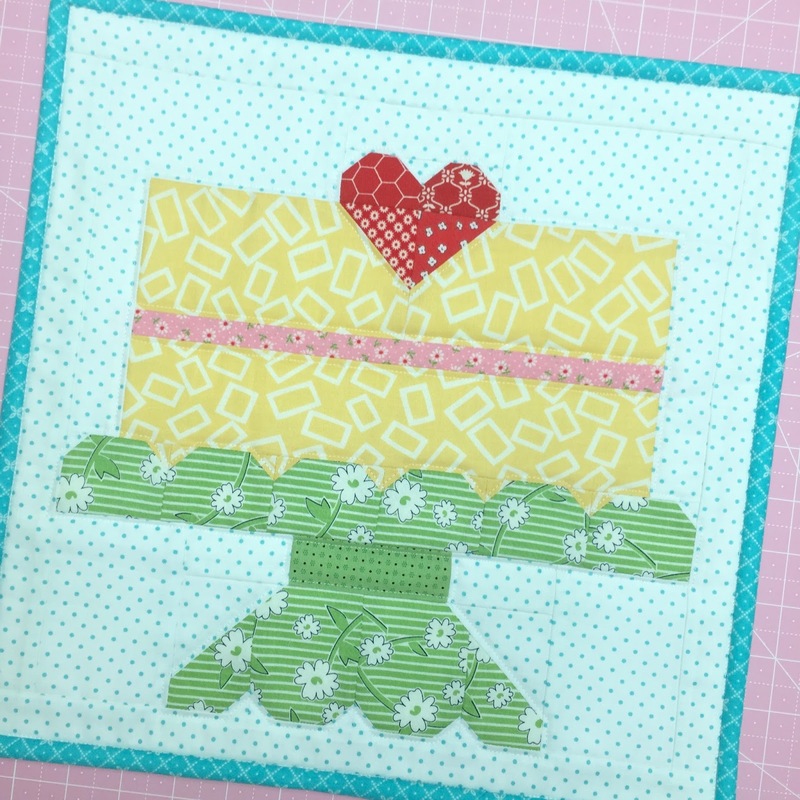 The cake block pattern is perfect. My head is swimming with ideas how to use it. I am a NW Wisconsin farm wife / mom / grandma. I retired from 43 years of teaching this spring. Your book is calling my name!! Lori, Lori, Lori...what have you done to me???? I can't stop making Farm Girl quilt blocks. Don't you know I have a grandson arriving in 6 weeks??? I have quilts to finish for him, but whatever magic you put on that book just won't let me stop. Seriously though, I have fallen in love with this book and will probably make most of them. I have found the companion blocks...yeah, thanks for that too...and am really having fun. I chose to make the 12" blocks as I am (was!) 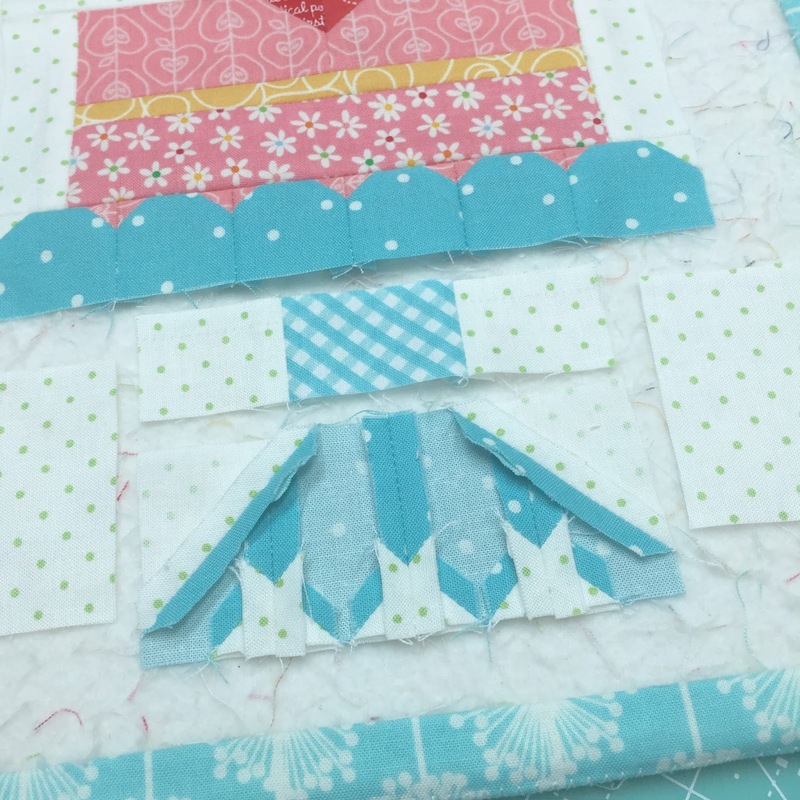 working on the Splendid Sampler and those 6" block is are enough for me. 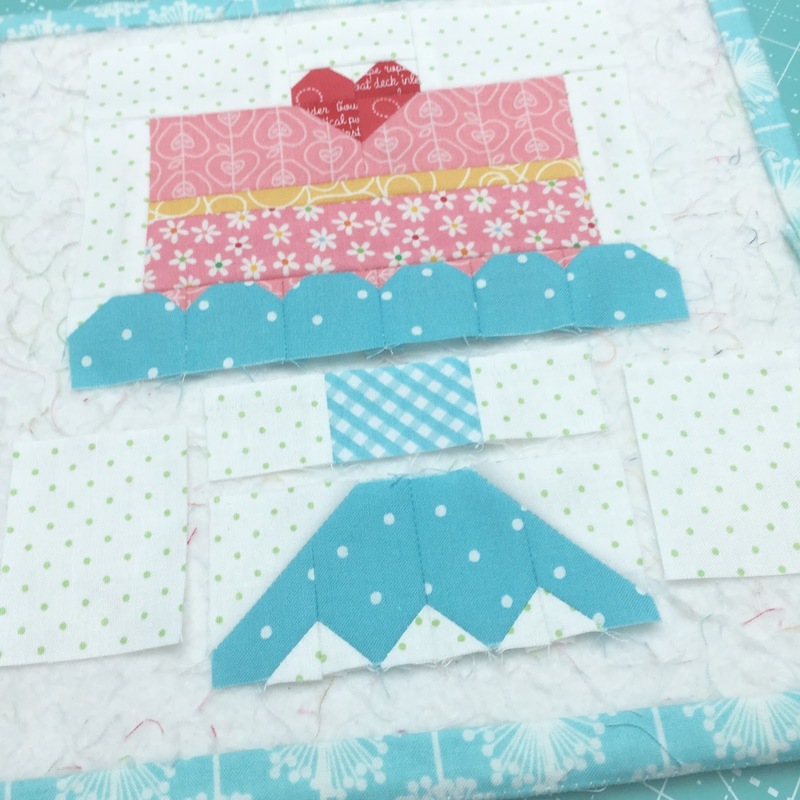 Looking forward to more companion blocks...maybe a dog? Thank you for sharing your amazing creativity with the quilting world!! !...and, we share a name!! 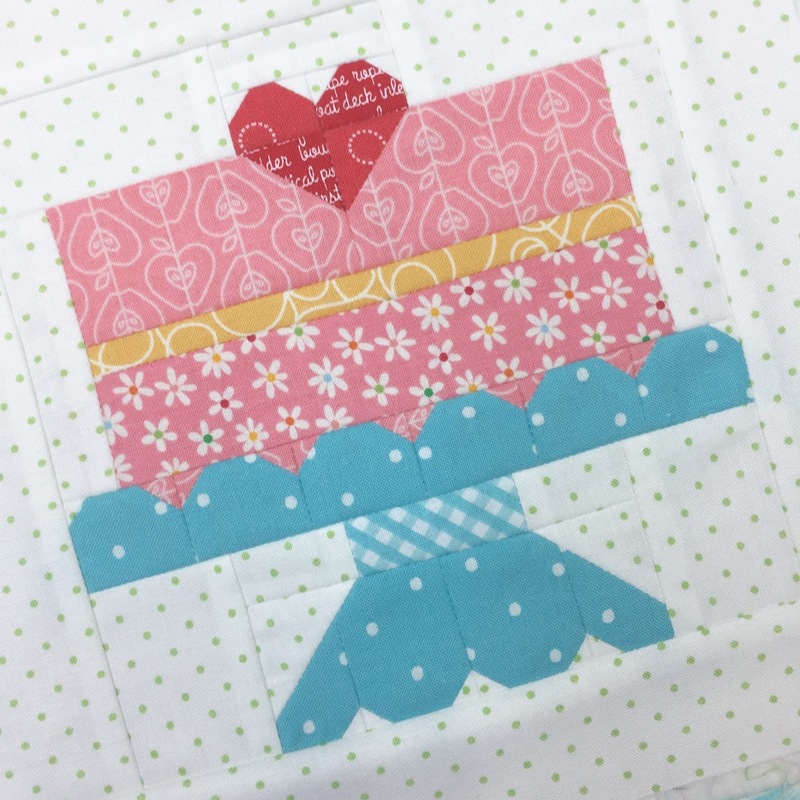 LORI R.
I have machine stitched many quilts but have never appliquéd individual blocks like this before. 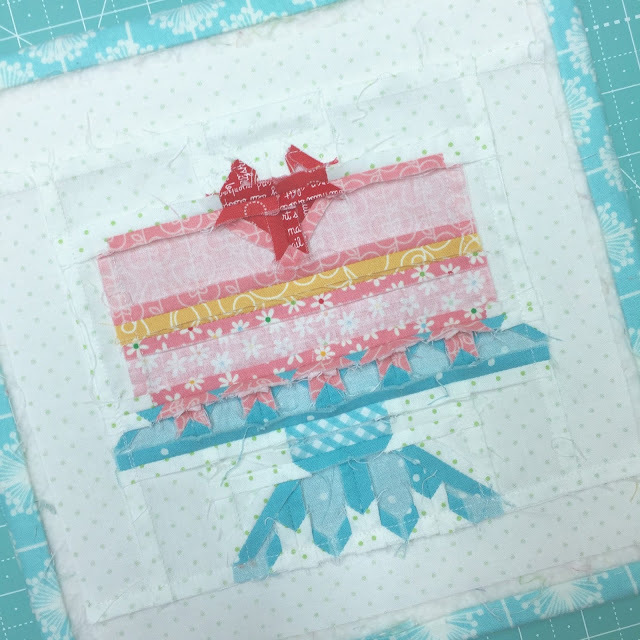 I am currently working on the Cozy Christmas quilt and although I got a late start, it seems to really bring me such joy to finish a block. 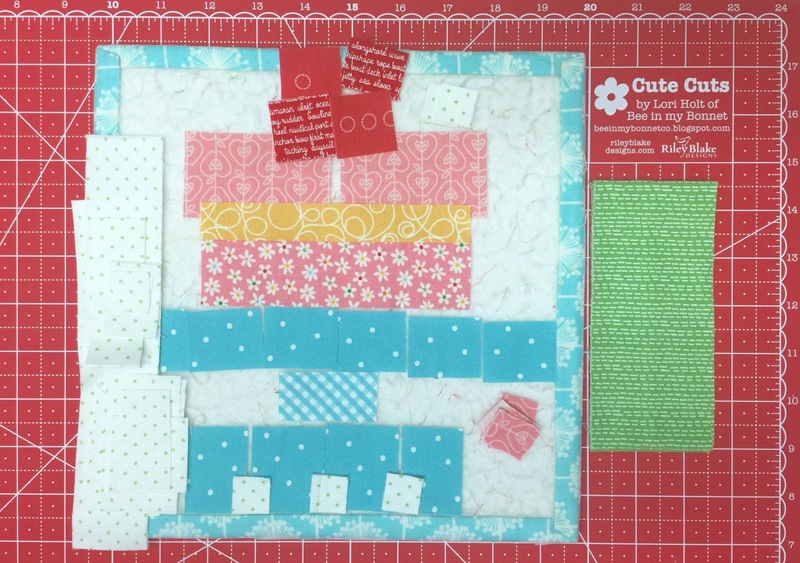 I've always loved Christmas and everything about it and I think this will finally be a quilt just for me. Your fabrics and appliqués make me smile. Can't wait to make the cake square! 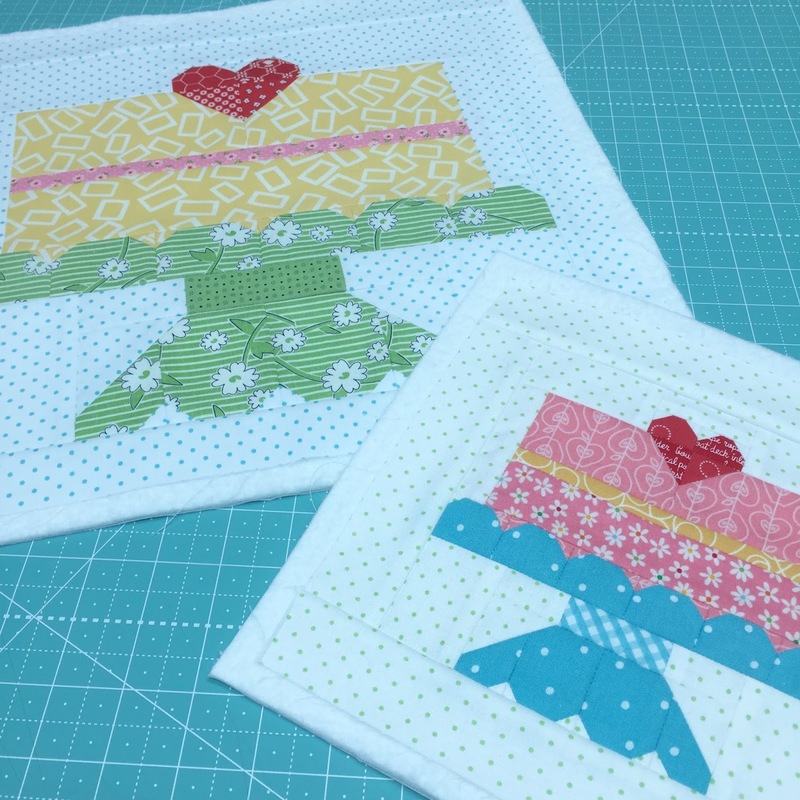 BLOOM Sew Along - The Big Finish!! !